As I run weekly water color painting classes I thought you might like to see each work which is produced on a weekly basis. Most paintings take about two classes to complete, each of about two and a half hours duration. However some are finished in one week and others take three or more. This regular post will hopefully be of assistance to my regular students as well as others with a general water color painting interest. For me it will serve as a record of the paintings produced in my water color classes. As I run two classes each week, with each class often working on a different water color painting I should have enough material for one posting each week – except for holiday times between the middle of December till the beginning of February. From time to time I may post partly completed paintings. 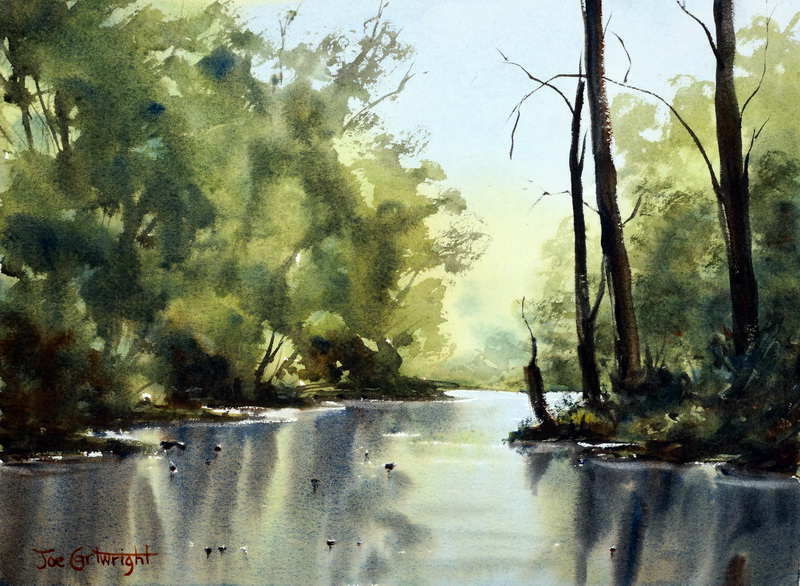 This weeks painting is of the Nepean River which is about a ten minute drive from my home. The actual location is at a fairly calm part of the river with lots of green foliage and dark shadows. I found this spot one day by accident and realised it would make a great painting subject. I have found some water color artists have difficulty with watercolor paintings with lots of greens in them but I am not sure why this is so. I often paint green based water colors and have not found any real problem with them. To keep the greens clean and bright it is important not to let reds enter you mixtures as this will grey the greens off. The trick with the greens I have found is to produce three different versions, a light tone, medium and dark tone, before you touch the paper. I then modify these as I paint away. By having the core green colors pre mixed it speeds up my painting time and keeps me well ahead of the paper drying too fast.